Houston has died at a hotel in Beverly Hills. We will update as details emerge. A police crime lab vehicle was seen outside the hotel just moments ago. So far, the details surround Houston's death are unclear. News of Houston's death came on the eve of music's biggest night -- the Grammy Awards. It's a showcase where she once reigned, and her death is sure to cast a cloud on Sunday's ceremony. Houston's longtime mentor Clive Davis was to hold his annual concert and dinner party tonight; it is unclear if it was going to go forward. Alan Duke reports that Ray J found her dead. Alan Duke reporting now that Ray J's publicist says Ray J was nowhere near Whitney before or at the time of her death, and that he did not find her dead. Sherri Shepherd tweeting that Ray J did find her dead. Other tweets from Hollywood sources also state that Ray J found Whitney dead. Paramedics were called to the Beverly Hilton today when Houston was found unresponsive in her hotel room. Police arrived at 3:55 PM PST finding hotel security administering CPR. 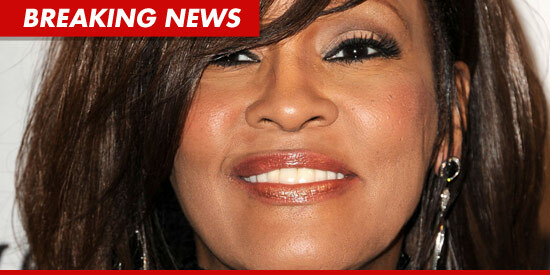 Whitney Houston's body remains at the hotel as the scene is under investigation. Clive Davis to continue with party tonight. Quincy Jones saying I am absolutely heartbroken of the news of Whitney's passing... Many other famous musicians, stars, and celebrities are tweeting heartfelt emotional messages. Mariah Carey tweeted "Heartbroken and in tears over the shocking death of my friend, the incomparable Ms. Whitney Houston." Dr. Drew says that resuscitation attempts were aborted after 20 minutes, therefore she must have been dead for some time before they arrived. Apparently, Whitney was in the bathtub at the time of her death, and while no illegal drugs have been found in the hotel room, prescription drugs were present. Some are speculating that Whitney drowned in the bathtub, possibly passing out after using prescription drugs. It is being reported that when EMTs arrived, Whitney's body had already been removed from the bathtub so it will take an autopsy to determine if she OD'd, drowned or died from some other cause. Informed sources say that Beverly Hills cops, who were still searching the room at the time this story was posted, found a variety of pill bottles, but that there was no evidence that Whitney was drinking alcohol in the room. Whitney's body was just removed from the room on a gurney. It will go to the morgue for an autopsy to determine cause of death. Whitney then seen leaving the club on Thursday Feb. 9, 2012 did not look very good.